My appearance on an episode of The Balancing Act on the Lifetime Network aired on Friday, September 2 and again on September 14. I’m D. A. Crossley, Jr., a retired professor at the University of Georgia. My nickname is “Dac.” I’m an emeritus professor of ecology. And a curator emeritus of ticks and mites in the Georgia Museum of Natural History. I grew up in a little city in south Texas, Kingsville. It's the home of the famous King Ranch. Grandma King donated land for the city. It was also the home of railroad shops for the St. Louis, Brownsville and Mexico railway company. Everybody in town worked for the railroad or the ranch, or did business with them. After WWII I went to the local college, Texas A&I, and soon migrated to Lubbock, to Texas Tech in the Panhandle. I started as an English major but fell under the influence of a charismatic biology teacher. I never looked back. My doctorate was in Entomology at the University of Kansas, where I studied the classification of chiggers - redbugs. I think I'm still the U.S. expert. I'm the survivor. After the University I was hired at Oak Ridge National Lab as an ecologist. Which I surely wasn't. In those days (1950's) almost nobody was. I looked at the effects of radioactive waste on forests and fields. A fortunate turn brought me to the University of Georgia, where I had the privilege of working with some excellent ecologists. With retirement looking me in the face, I turned to my first career choice - writing. And hit my stride in writing about South Texas in its pre-civilized days. The Old West lived on for decades down near the Border and in the Wild Horse Desert. 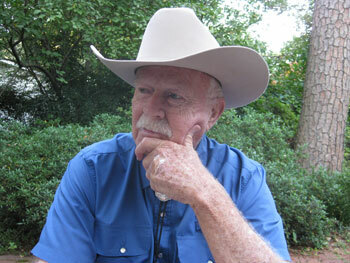 Family stories and tales I was told as a child form the basis for my Texas novels. I am a widower with one daughter, Mary Freeman, a stream ecologist of note, and two sons Greg and Steve Blankenship, contractors, green builders.